Julia Lee shows off her bear coat on Aspen Mountain for closing day on Sunday. Corn snow and blue skies accommodate skiers and riders for the 47th annual Bell Mountain Buck-Off on the Ridge of Bell at 1 p.m. Sunday. 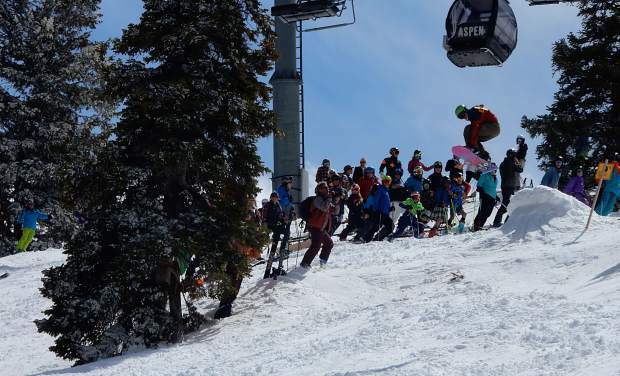 A crowd cheers as a rider catches air on Boyd's Bump on the Ridge of Bell Sunday for closing day on Aspen Mountain. 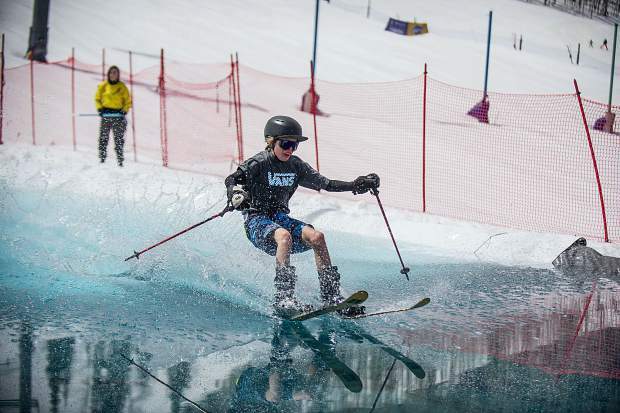 Owen Nelson,12, skis across the pond skim at Snowmass for closing weekend on Sunday. 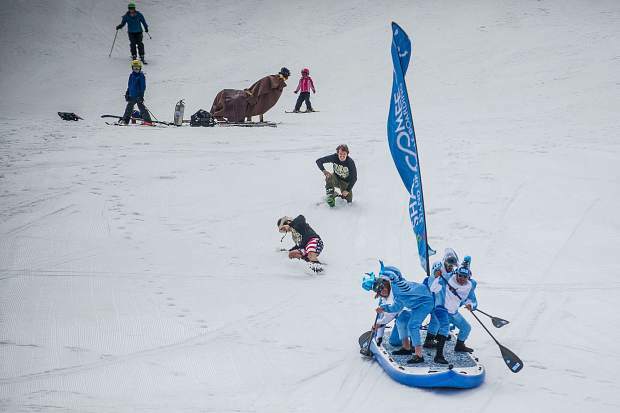 The Shaboomee Snow Sharks make their way down on an oversized stand up paddleboard on Sunday at Snowmass for Schneetag on closing weekend. 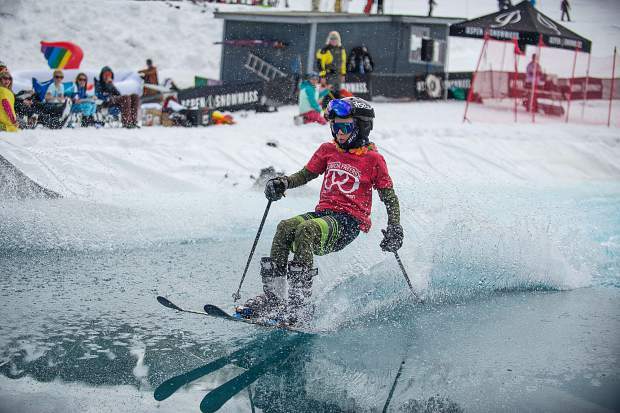 Mason Pfaffmann,12, skis across the pond skim at Snowmass for closing weekend on Sunday. 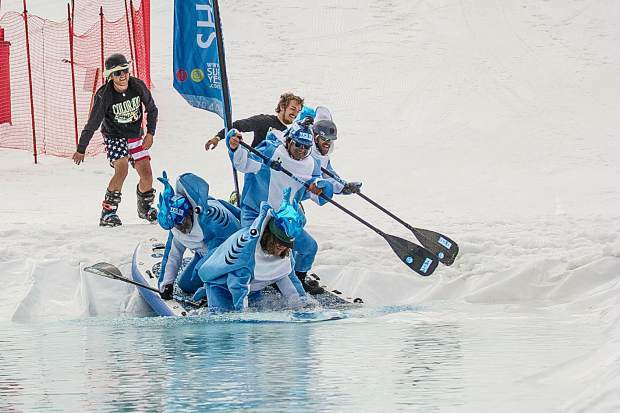 The Shaboomee Snow Sharks make their way down on an oversized stand up paddleboard into the pond on Sunday at Snowmass for Schneetag on closing weekend. Jim Callen snowboards across the pond skim at Snowmass for closing weekend on Sunday. 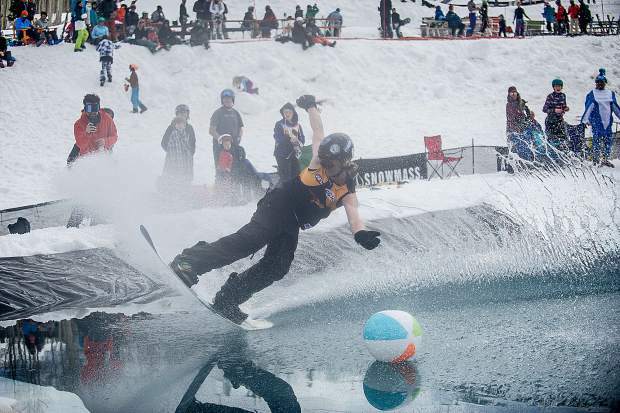 Doug Ward crashes into the pond on his float for the Schneetag competition in Snowmass for closing day on Sunday. 40-year-old New Yorker Chip Foley wipes out during the pond skim on Sunday at Snowmass for closing weekend. Darren Green wipes out during the pond skim at Snowmass on Sunday for closing weekend. 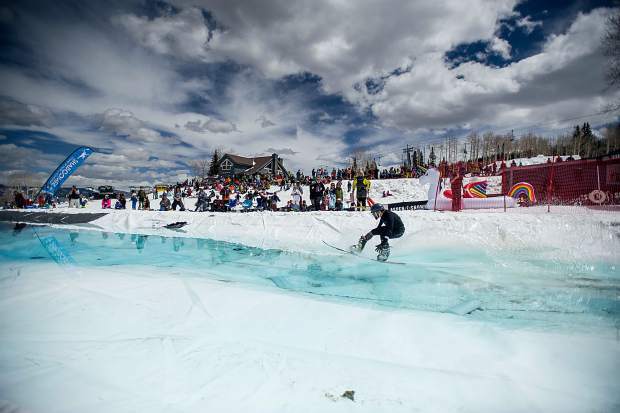 Jamie Murphy snowboards across the pond skim at Snowmass on Sunday for closing weekend. Excellent spring skiing conditions with fresh snow and plenty of sunshine Saturday and Sunday helped make up for the long, strange trip that was the 2017-18 ski season. 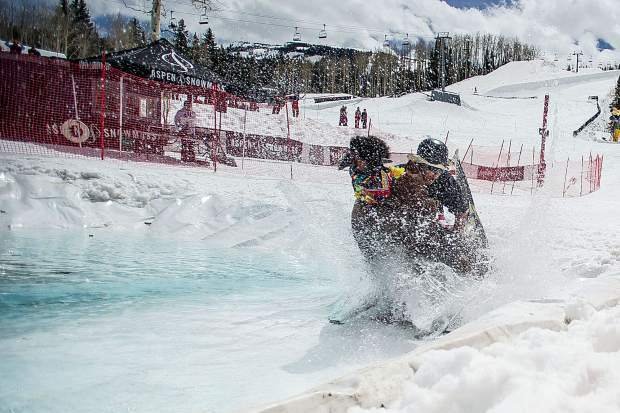 Lions and tiger and bears prowled Aspen Mountain on Sunday, some girls were rocking bikinis, some guys were wearing gruesome cutoffs and lots of people were wearing neon-colored, throwback one-piece ski suits. 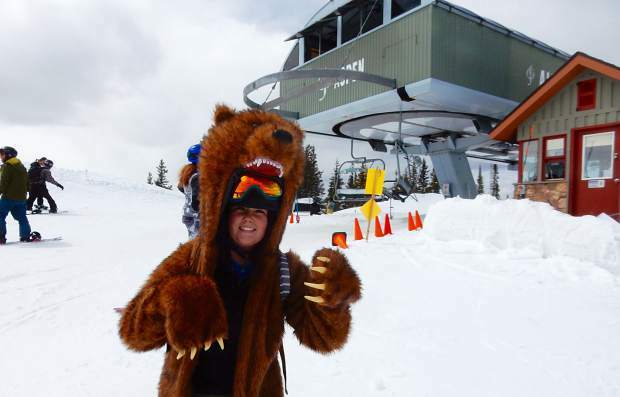 Julia Lee, who is working her first season at Aspen Snowmass, ripped it up at Aspen Mountain sporting a bear outfit featuring long fake front claws. The coat didn’t have the beer-soaked, mangy look of a veteran costume even though Lee wore it for the closing at Aspen Highlands last weekend. She was wearing it on the Ajax Express lift at Aspen Mountain as closing day dwindled down. She planned to get her money’s worth by wearing it to the employee party at Snowmass on Monday. Hundreds of people participated in or watched the 47th annual running of the Bell Mountain Buck-Off, held every scheduled closing day at 1 p.m. on the Ridge of Bell. Some skiers and riders performed acrobatics off Boyd’s Bump — a jump built on the ridge — to the ooohs and aaahs of the assembled crowd. A handful of the folks performing stunts hit the ground in spectacular blowout crashes. Skiers and riders made en masse descents in a couple of waves and were led through Bingo Slot by the ski patrol. 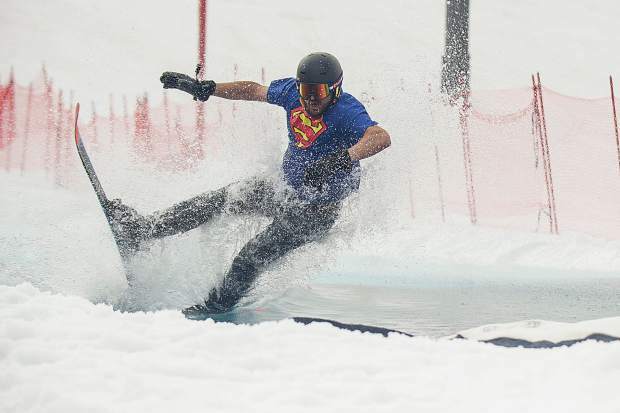 At Snowmass, the pond-skimming event at the Spider Sabich picnic area saw a number of skiers and boarders stylishly make it across the water. It was a different story for the groups in homemade crafts, including a few dressed as sharks and other in Aspen Fire gear. They needed help just to get to the pond, and then failed miserably at execution. Sunday marked the final day of work for Aspen Mountain manager Peter King after a 45-year career with Aspen Skiing Co. 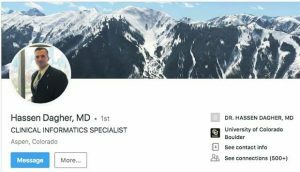 He spent that past 12 years as Aspen Mountain manager. He said the early-season drought created some hairy times. The rule of thumb is 18 inches of snow base is needed before snowcats can “track pack” early in the season — running back and forth with the tracks to knock the air out of the snow and compact it, he said. But Mother Nature wouldn’t comply, dropping only 14 inches in mid-November. The decision was made to go ahead and track pack the lesser amount. 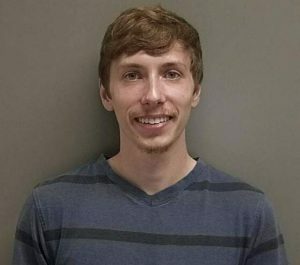 “That turned out to be the lifesaver,” King said. Another key to salvaging the season was persistence with snowmaking, according to King. Conditions were so warm for so long that snowmaking crews had trouble finding sustained times to blow snow. They found small windows and extended efforts into January, beyond the normal time. “I’ve learned we can’t control the weather so you make the best of it,” King said. The effort paid off, with Aspen Mountain managing top-to-bottom skiing when the other ski areas were plagued by bigger brown patches. “We had bigger crowds at Christmas on less terrain (than last season),” King said. 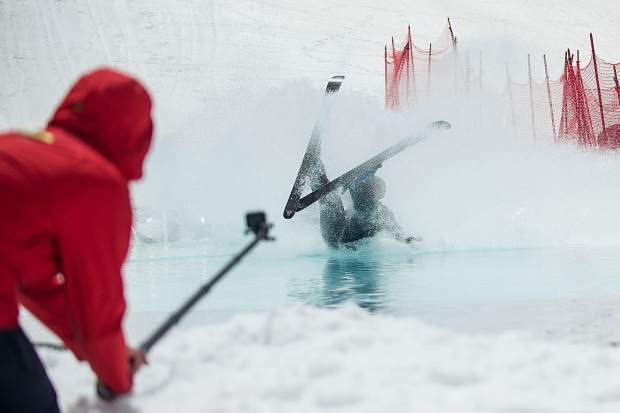 Aspen Mountain managed to increase its skier visits over the course of the season even though Skico overall is down, according to Jeff Hanle, vice president of communications. Skico’s skier visits were down 20 percent overall at its four ski areas as of the end of December. 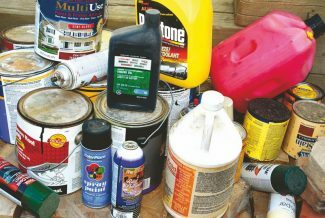 The company “clawed back” somewhat but will end up with fewer visits for the season, Hanle said. 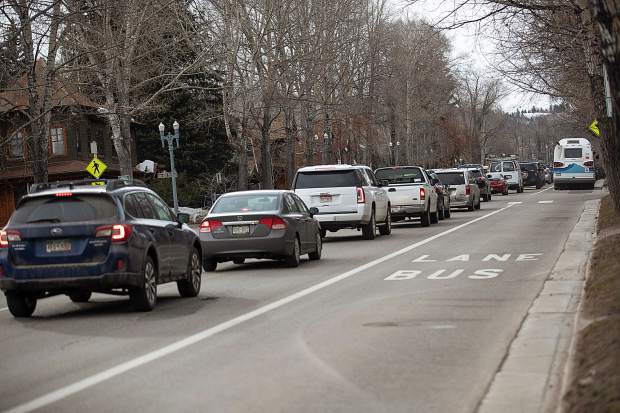 The Aspen-area snowpack currently stands at 80 percent of average, but for much of February and March hovered at 66 percent. It appeared that the winter turned around in February with an intense three-week period of snowfall that exceeded the amount from the prior months combined. However, snow was spotty in March and April and temperatures warmed considerably. 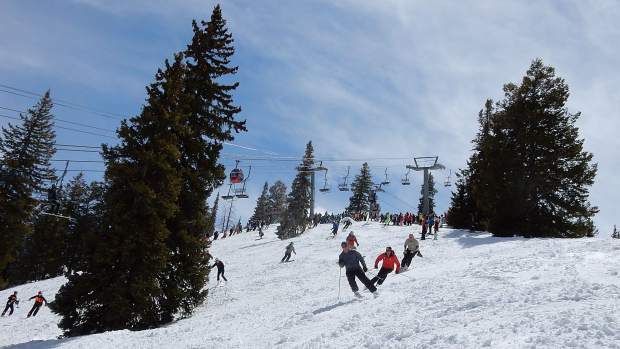 In addition to skier visits falling, the number of 100-day ski pins issued also dropped. As of Friday, there were 256 customers who had earned their pins, Skico said. Last year, there were 341. Mike Regan was among the skiers who earned a pin by making the turns. He was cutting it up in the trees of High Alpine at Snowmass on Saturday and ripping it up at Aspen Mountain on Sunday, his 111th day on skis this winter. He suspects a lot of people who were complaining during the season weren’t actually on the slopes. Erik Peltonen, another regular on the slopes and an Aspen Mountain loyalist, provided a different perspective. While he soldiered through the season he made it clear at the Sundeck on Sunday that he had had enough. “I’m glad it’s … over. You can quote me on that,” he said.